Beautifully furnished 4 bedroom villa with private pool, superbly located close to the facilities on El Valle Golf Resort; sleeps 8/9 people. We have been a couple with three teenagers one week in August and everything is perfect. The unbeatable property, cozy rooms with exquisite decoration, exterior and luxury swimming pool, perfect cleaning, cooking utensils in abundance and highlight the professionalism and attention of the hostess Linda, who at all times attended us quickly and kindly to our questions. I would definitely recommend the property as it has been a vacation for my whole family that we will not forget. Thank you. Lovely stay in a villa that has everything you need. A friend of mine and I stayed at this villa in November last year. I am very familiar with the area, having once owned a villa on the complex. People on Camposol have all got a good community spirit, and will always help you out if there are any problems. We actually had a small problem with the gas bottle outside and the people in the villa opposite came to our rescue. Unfortunately I cannot say the same about the neighbours who made derogatory remarks about the villa being rented out. It is very sad that the owner has neighbours like this, especially as she provides an excellent service. All the instructions were spot-on, and I am sure the owner would not rent out her villa to anyone whom she thought was unsuitable, so in my opinion, there is no justification for their remarks. We had a great time and can thoroughly recommend this place. We are a family of 6 that stayed in this villa in November 2017. The process of the booking was very smooth, we had a number of queries before we went on holiday and Linda responded very quickly and was extremely informative regarding the local area. The Villa is about a 5 min drive to B Sector which has a number of Bars, Restuarants and a Supermarket that provides both local produce and some English branded groceries if you are missing something from home. About 15 - 20 mins away you are in the Port which has many resturants, a lovely beach and the ability to do watersports. The Villa itself was exactly as described, we found the rooms to be very spacious and the Air Conditioning worked well (you do have to have the doors shut for it to work though!) We really enoyed sitting on the terrace in the evening whilst watching the kids playing in the pool. Watch out for the grumpy neighbour that lives next door as they live there all year and seem to get upset with people enjoying themselves!! Things that I liked best about the villa: 1) Loads of space for the kids 2) Brilliant Pool 3) Internet worked while we were there Things that could be improved: 1) A bit more shade as it can get quite warm and the only option is to go inside 2) Sun Beds were looking a bit worse for wear 3) A note to tell us how to turn the water on! (we panicked when we got there as the water wasn't working. We called Linda and this is because she has a special stopcock that needs to be switched on at the side of the villa) Overall we had a great break. It was exactly what the doctor ordered and gave us some undisturbed family time together. We enjoyed a lovely family holiday at Villa Loaiza. A home away from home. Pat (the key holder) was prompt to address minor issues, which was much appreciated. la Manga Club is very well maintained and feels safe with good security. Lovely stay in Linda's villa. 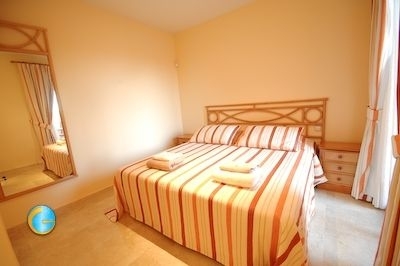 Perfect for a quiet family holiday - the pool is great and the Vila is comfortable. The location is quiet secluded so definitely need a car. Decent value for money. Our best ever holiday...Apartment is great...Comfortable bright...well laid out. Lots of variety of kids channels. Location is perfect for travelling with kids. Literally 5 mins from the Airport. Staff are great and so helpful. Lovely bar called the Spinosa next door. Good local supermarket and an fantastic market on Saturdays. We hired bikes from costablancabikehire.com which made the holiday for us and kids as it's just a short leisurely 5 minute spin into town. Even though it's quite close to the Airport we weren't bothered by Jets coming in and out all day. The seemed to be confined to mid morning and evening. It was the first holiday in years we were actually sad to leave...we loved it that much“Little piece of Heaven "
Many thanks to you The Villa Dearsley, offers exactly and more than is advertised. The standard and quality of the accommodation is modern and clean. The self catering facilities provide everything that is required for a comfortable stay. A week in late October still managed to provide for 25 degree C temperature. If you like or love golf or just want to try, the resort course or those very local are a must. A car is not essential as there is a great taxi and bus service from the local town, but having a car will also allow you to see so much of the traditional and cultural area. Will definitely look to go back next year.